Running Time: 6 hours 5 minutes. PGN files: Included, light annotations. 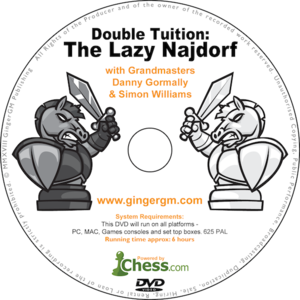 In this second instalment of the Double Tuition series, Ginger GM presents The Lazy Najdorf. Hosted by GM Danny Gormally and GM Simon Williams, this 6+ hour DVD aims to teach you one of the most aggressive replies to 1.e4, the Najdorf. 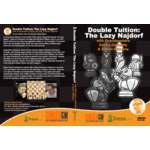 The second DVD in the new Double Tuition series, this unique format offers unrivalled expert tuition from two Grandmasters on your favourite openings. Ginger GM is pleased to welcome back long-time Najdorf aficionado GM Danny Gormally, who provides expert analysis and theoretical knowledge on one of the most popular chess openings of all time. Also on hand is GM Simon Williams, who utilises 20+ years of teaching to ask questions relevant to the casual or club player, ensuring that there is no stone left unturned in helping you learn this aggressive and historically-respected variation of the classic Sicilian Defence, frequently employed by world champions Bobby Fischer and Gary Kasparov. Rather than bombarding the student with endless theoretical variations to memorise, The Lazy Najdorf aims to teach you the main ideas, concepts, structures, replies etc in an easy-to-remember and simple fashion. Boasting 17 key games with expert Grandmaster analysis, and 7 distinct chapters of sharp theory, this DVD provides the chess student, novice or advanced alike, with everything you need to confidently begin to play this opening or refresh your previous repertoire.